It was a very wet Tree-mendous Tuesday , but no one was put off with a little bit of rain. We know that as soon as we get into the woods we are protected by the trees anyway. So we put our hoods up and off we went to hunt for minibeasts, armed with our magnifying glasses so we could get a closer look. We took a detour and had a look in the farmer’s field to see what was growing and Mrs Fenton opened one of the pods to find broad beans inside. They were a bit like the sugar snap peas that we eat in Foundation. Mitchell spotted a leaf on the floor that had a hole in it. He told us that the caterpillar had eaten it because he had tummy ache, which is exactly what happened in our story of The Very Hungry Caterpillar. We made our way into the woods and turned over a few logs to see what we could find lurking underneath and to our delight we spotted a few minibeasts. I don’t know what they thought when they saw our big faces looking down on them! The spider scurried away, but the slug just sat on the tree trunk very patiently whilst we all had a close look. We made sure that we put the log back so that our new friends could go back to sleep. 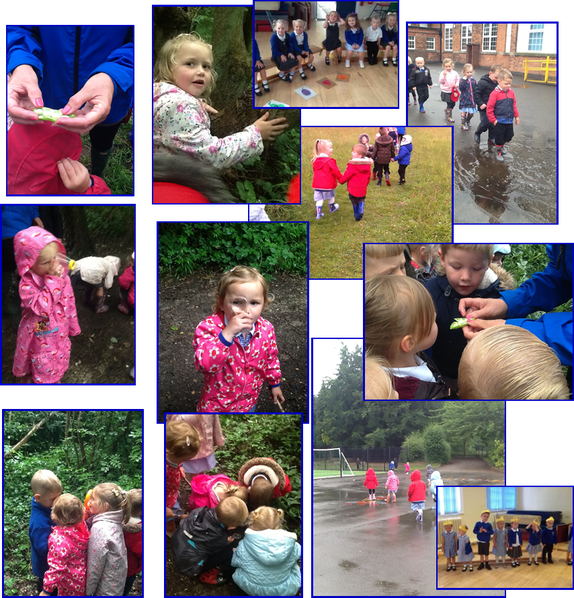 On our way back to Foundation, we found a huge puddle and there is only one thing to do when you find a puddle - and that’s exactly what we did! Splish, slosh! Both of our assemblies were fabulous and the children did us proud with their story telling, counting, singing and dancing skills. We would like to say thank you to the kitchen team for making us a yummy cake. We ate it after our award winning performances; it was much needed! Next Tuesday, we are spending our last Tree-mendous Tuesday adventure visiting Langold Lake and having a picnic. What a way to end a fabulous year!